SO HAPPY. That’s exactly how I feel after watching this episode and this drama. Countless lunches and cute Shan-Teng moments later have brought us to this last episode of Boss & Me. I’m already missing seeing our OTP and their trademark adorableness, but I promise that you won’t be disappointed with how everything turns out for our beloved Shan Shan and Feng Teng. Prepare to have your hearts melted, but let’s be real, would you have expected anything less? It turns out that those two guards that Feng Teng hired after the incident with Liu Liu’s ex at F.S. aren’t only there to guard the store, but also to act as Shan Shan’s bodyguards. 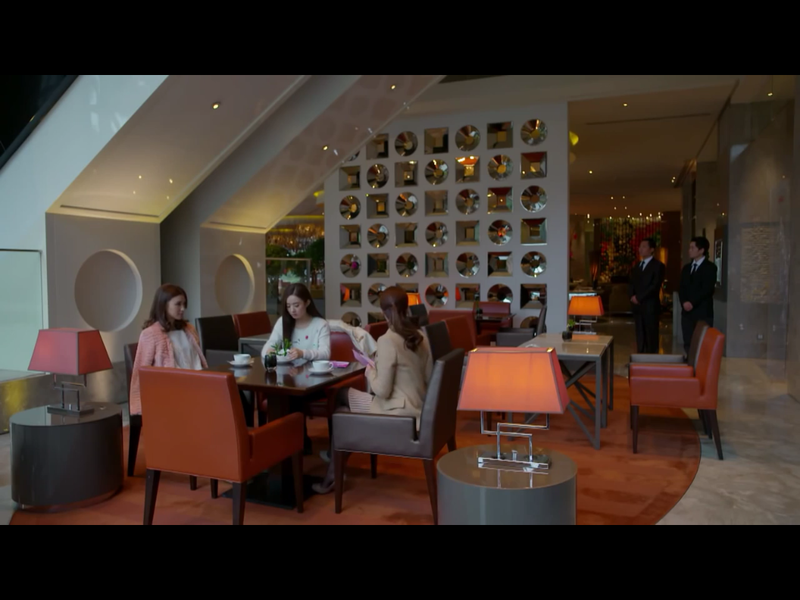 While lunching with Feng Yue and Li Shu, Shan Shan complains about how the bodyguards are so unnecessary. Li Shu completely agrees with her and thinks that Feng Teng is totally overreacting, especially when Liu Liu’s douchey ex has already been arrested. You’ve done good, Shanghai Police. Feng Yue, on the other hand, sides with her brother and tells Shan Shan that her safety is his number one concern, so obviously he’s not going to take any chances. Shan Shan tells them that she doesn’t plan to stay F.S. forever, so she’ll soon return to her normal life that doesn’t call for bodyguards. Still, she’ll put up with them for now if it will put Feng Teng’s mind at ease. As they’re chatting away, someone comes up to say hi to Feng Yue. Why it’s none other than famous actress, Wang Pin Ruo…who is also Feng Teng’s ex. Right off the bat, you can tell that she and Li Shu are definitely not friends. Probably to annoy Wang Pin Ruo, Li Shu enthusiastically introduces Shan Shan as Feng Teng’s girlfriend. Wang Ping Ruo notices the F.S. brochure on the table and asks if this is the supposed jewelry company that Windgroup has been involved with lately. Feng Yue tells her that it’s actually a business started by Shan Shan and her cousin, and Wang Pin Ruo’s all like, “Oh, I get it.” Too bad Shan Shan is too starstruck to notice all this shade that’s being thrown her way. But the reporter that had just finished talking with Wang Pin Ruo seems to be interested in learning more about F.S., and even asks Shan Shan if she might be interested in having F.S. featured in their magazine. Yay for free advertising. That night at the Feng mansion, Shan Shan keeps talking about wanting to hire Wang Pin Ruo to be F.S.’s spokesperson, not noticing that Feng Teng’s face darkening. Later, Feng Yue asks her if she’s gone crazy. Not only is Shan Shan defying Feng Teng’s wishes to stop working at F.S., now she even wants to go and invite his ex-gf to be her company’s spokesperson. Li Shu also advises Shan Shan that this has bad idea written all over it. She says that unlike her previous one-sided crush on Feng Teng, he and Wang Pin Ruo actually dated and this woman is definitely not someone she wants to mess around with. Shan Shan tells them to calm down because she has total faith in Feng Teng, so there’s nothing to worry about at all. Someone gimme Wang Pin Ruo’s #. While at home, Shan Shan gets a call from the magazine asking if she and Liu Liu would be interested in being interviewed. The good news for F.S. keeps rolling in because she then gets a text from Wang Pin Ruo’s manager saying that she’s agreed to be F.S.’s new spokesperson. At the exact same time, Feng Teng gets a personal text from Wang Pin Ruo telling him about the news. Feng Teng tries to show Shan Shan that obviously something shady is going on if she got a text from her manager, but he got a text directly from Wang Pin Ruo. He asks her if she’s really this innocent or if this is her way of testing him. Shan Shan reassures Feng Teng that he’s being too sensitive. And since she trusts him completely, nothing could possibly happen between him and Wang Pin Ruo. After Shan Shan tells Liu Liu about the magazine article, she tells Shan Shan that she often wondered why she’s so unlucky. She may have used her ex-bf to get away from her mom back home and come to Shanghai, but it’s her own fault for getting involved with a guy like that and ending up owing so much money to the Fengs. From now on, she’s only going to focus on paying off the money and F.S. She asks Shan Shan to not mention dating or anything of that sort to her for now, or at least until the money has been paid back and Shan Shan is officially Mrs. Feng. Chill Liu Liu; no one said anything about dating. Shan Shan tells her that she is actually really happy to have been able to start this business with her because this is finally her chance to prove herself. While having lunch in Feng Teng’s office, Shan Shan tells him that the F.S. has been bringing in money lately, so she and Liu Liu will have more money to give him soon. But when she mentions how she has to use a portion of their profits to pay for Wang Pin Ruo’s fees, Feng Teng asks her if it’s worth it to hire her to be their spokesperson. Shan Shan tells him that of course it’s worth it because it’ll only bring more business to F.S. She then casually tells him that Wang Pin Ruo made one little request…she wants Feng Teng to visit her on set during the commercial shoot. Feng Teng says that it’s fine since he hasn’t seen her in awhile anyways. Hearing Feng Teng agree, Shan Shan is all giddy. He eyes her suspiciously and asks why she’s so happy that he’s going to see his ex. But Shan Shan’s too busy thinking about the commerical to notice how annoyed Feng Teng is. Resorting to the cutesy act. On set for the commercial, Feng Teng hasn’t shown up yet and Shan Shan is worried that he’s going to bail on them. Li Shu tells her that she’s more worried that he will show up, and that sparks between him and Wang Pin Ruo are gunna start flying again. When Feng Teng does finally show up, Wang Pin Ruo wastes no time in flirting with him. Shan Shan immediately rushes over after seeing them chatting, and claims Feng Teng as hers by calling him her fiance. You can stop batting them lashes now, Wang Pin Ruo. Hearing that Feng Teng and Shan Shan are engaged, all the reporters that are on set swarm them with questions. They escape the crowd, leaving Wang Pin Ruo to fend off the reporters. Later, Feng Teng tells Shan Shan that she sure has grown up. No one messes with our Shan Shan anymore. Feng Teng later shows Shan Shan a text from Wang Pin Ruo asking him to dinner. Shan Shan ain’t sweating it though because she has thought things through, and she’s not going to get jealous or worried about these girls anymore. She knows that it’s inevitable that girls are going to be flirting with Feng Teng and trying to replace her, but she’s confident enough to know that all their homewrecking attempts are useless. Thatta girl! Shan Shan admits to Feng Teng that she actually doesn’t have any interest in the jewelry business, or business in general. But she can’t bear to leave Liu Liu to work by herself to pay off the debt, so that’s why she’s staying at F.S. After the debt is paid off, she doesn’t want to become some sort of powerful businesswoman or a socialite. Instead, all she cares about is being able to call herself Mrs. Feng. C’mon Shan Shan, you can be a little more ambitious than that. But I guess being Mrs. Feng is a pretty sweet gig. Things are looking good for Shan Shan and F.S. because business is going so well that the debt should be paid off by the end of of the year! During the magazine interview, Wang Hong (F.S.’s jewelry designer/guy crushing on Liu Liu) asks Shan Shan why she doesn’t want to take part in the interview since she’s also one of the co-founders of F.S. She tells him that this business is Liu Liu’s dream, and the most she can do for it is look after the money. So, it’s only right that Liu Liu is the one being interviewed since she should get credit for F.S.’s success. Wang Hong tells her that he thinks the story of two small town girls starting a business on their own in Shanghai is a very amazing thing. Shan Shan thinks to herself if that’s really the story of how F.S. came to be. Shan Shan and Liu Liu reveal in the magazine article that the only reason they started F.S. was because they needed to pay off a 10 million yuan debt to Feng Teng. In a TV interview, Liu Liu also tells her own story about her douchey ex that stole the money to begin with. She admits to using him as a way to come to Shanghai, but accepts that she deserves the full blame for why she and Shan Shan ended up having to repay the 10 million. The reporter congratulates Liu Liu for being such a strong and independent person, but she tells him that the real person who deserves all that praise is Shan Shan. She explains that Shan Shan may not seem like it, but she’s actually a really resilient person who never backs down from her obstacles. Teary-eyes all around. Credit goes to Shan Shan. Shan Shan and Liu Liu successfully pay off their 10 million debt to Feng Teng by the end of the year! After a well-deserved impromptu celebration outside of the bank, Shan Shan texts Feng Teng that they’ve transferred the remainder of the 10 million into his bank account. Feng Teng smiles to himself after reading the text. He walks over to his window and stares out onto the balcony, thinking to himself that he can’t believe that it’s already been another year. Ah, the nostalgia. 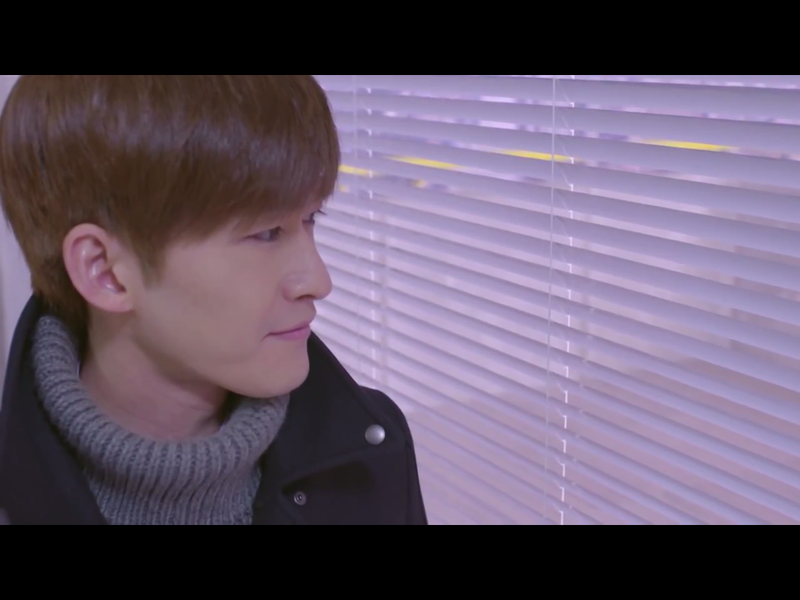 Shan Shan goes to Windgroup to meet Feng Teng, but before she enters the building, she stands outside for a little bit to reminisce about all her love moments with Feng Teng. We’re treated to Shan-Teng’s Greatest Hits, including when he first put his jacket around her on the balcony, her picking out scallions from his beef noodles, fishing together at the farm, and every other cute scene they had together. Omg, so many feels. All these feels. I’m already pretty weepy at this point, and the happy tears keep on rollin’ while watching this ridiculously adorable montage. Shan Shan meets Feng Teng on the balcony (where else? ), and he congratulates her for successfully paying off the debt through her own hard work. Shan Shan tells him that it was really hard work, but it was all worth it. She pulls out a ring box and asks him if he’s willing to marry her. Feng Teng pouts and asks how dare she take away his proposal, but she reassures him that it’s still considered his proposal because she used his credit card to buy this ring. And when Feng Teng tells her to just have Feng Yue plan the wedding for them, Shan Shan says that she already knows what she wants to do for their wedding. She pulls out her passport (throwback!) and says that she wants to travel the globe with him. Feng Teng gets down on one knee and asks her to marry him, and OF COURSE she says yes! I’m straight-up bawling my eyes out now. Okay, let’s be honest. I cried through the entire last five mins already. After sealing the proposal with a kiss, Shan Shan and Feng Teng turn to look at the fireworks bursting across the night sky, welcoming the new year. While watching Liu Liu’s interview on TV, Li Shu reveals to Zheng Qi that she’s pregnant. Congrats! Now that the debt to Feng Teng has been paid off and everything’s good with F.S., it looks like Liu Liu is ready to give Wang Hong a chance. Shan-Teng forever. I would like to think that they’re off traveling the world right now, and probably still being the cutest couple ever. Hope you all loved Boss & Me as much as I did! And of course, thanks for allowing the overuse of the words “cute” and “adorable” in practically every recap…but can you blame me? Keep an eye out for a series review on the entire drama where I’ll definitely be doing even more Shan-Teng fangirling. Now, let’s go make Shan Shan proud and eat a lot of good food! Shan Shan lai le (is here)! The best recaps…..hope you will still give alots of drama recap…thank you…. Glad you liked the drama! I really loved the OTP in this too!! Thanks for your recap it made me giggle, smile, annoyed with liu liu’s mom 😀 and had good time. Can you suggest another drama worth watching and reading? Thanks and more power! If you’re looking for a good romcom, The Producers (Korean) is worth watching. Back in Time (Chinese) was super underrated but I loved it. I recapped both those dramas, so you can take a look to see if they’re your cup of tea! ❤️ the show!! 👍 10/10 Thx you crew n cast. Thank you for the awesome recap! Loved it…especially the way you portrayed the evil Li Shu..that was so funny..
awesome recaps! thanks so much!